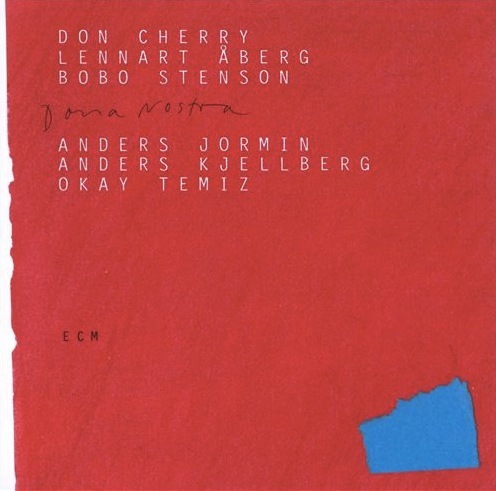 Trumpeter Don Cherry gets cozy with some of ECM’s brightest European talents for a onetime sextet of notable introspection: reedman Lennart Åberg, pianist Bobo Stenson, bassist Anders Jormin, drummer Anders Kjellberg, and percussionist Okay Temiz. It’s hard not to love the very concept, and the music lives up. “In Memoriam” opens the session’s eyes in a waking dream of deferential pianism and scurrying percussive accents. Jormin’s laddered circles sweep through Stenson’s, while lovely tenor work returns to the soil, even as it holds on to memories of the sun. “Fort Cherry” at last puts its namesake’s lips to brass, melding shades of Ornette Coleman into warm piano strains. For the direct Coleman digs, we need look no further than “Race Face” (which gives us the satisfaction of traction with some fresh and lively playing) and “What Reason Could I Give” (a noteworthy duet between Stenson and Cherry that is also the highpoint of this date). “Arrows” winds a stem of bass, pollinated by a flurry of spores. Well-rounded soprano and bass solos twist into a quietly spasmodic ending. “M’Bizo” begins as a viscous, Nordic-sounding dirge before emptying its waters into a Charles Lloyd-shaped vessel, cycling back and forth between these two modes toward “Prayer,” which features lovely playing from Jormin, searing lines from Cherry, and some beatnik style percussion thrown in for good measure. The suitably abstract color show of “Vienna” then sets us down in the ecstatic “Ahayu-Da,” all laced together by Stenson’s consonant presence for a breathless finish. While everyone contributes to this deceptively open session, it would be a crime to neglect Temiz’s vital contributions. These and more make this an album of incredible subtlety to be savored.